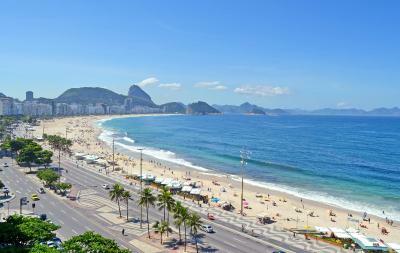 Lock in a great price for 55/RIO Copacabana – rated 8.2 by recent guests! Very good location, fair breakfast, nice view from the restaurant and room. Right at the beach, you just have to cross the street. Felt very safe over there, there was even a security guard. Other thing I liked is that the cleaning lady didn't came in my room while I was still in my bed. No knocking on the door if you were still there, just wait till I left and cleaned after that. I loved the view of the beach, and hear the waves during the night. The staff was very attentive and sweet. Super well located, clean, comfy and most of all, staff super nice!! I love loved loved the staff they were awesome. The breakfast with a million dollar view was great. The room was comfortable. The hotel location is excellent. The staff is very friendly, always help you with any problem!!!! 55/RIO Copacabana This rating is a reflection of how the property compares to the industry standard when it comes to price, facilities and services available. It's based on a self-evaluation by the property. Use this rating to help choose your stay! One of our top picks in Rio de Janeiro.Located on the seafront and boasting magnificent views of Copacabana Beach and Sugarloaf mountain, 55/RIO Copacabana is located near many tourist attractions and is 2,150 feet from Cantagalo subway station. WiFi is free. All rooms at 55/RIO Copacabana are equipped with air conditioning and free Wi-Fi access and contain a cable TV, a mini-bar and a private bathroom. They feature wood floors and provide a safe and a telephone. Ipanema Beach is 0.9 mi from 55/ Rio Copacabana, while Copacabana Fort is 0.6 mi away. Santos Dumont Airport is at a distance of 5.9 mi and Galeão International Airport is 17 mi from the property. When would you like to stay at 55/RIO Copacabana? Single or double accommodations overlooking Copacabana Beach. It comes with air conditioning and Wi-Fi and contains a cable TV, a minibar and a bathroom with amenities. Some rooms offer an LCD TV. Single or double accommodations with an internal view. It comes with air conditioning and Wi-Fi and contains a cable TV, a minibar and a bathroom with amenities. On the 11th floor, all Master Suites offer a unique layout. Two suites provide 2 separate rooms and one suite features a spacious balcony with a view of Atlantica Avenue. Equipped with air conditioning and Wi-Fi, they contain a cable TV, a minibar and a bathroom with amenities. All can accommodate up to 4 people comfortably (additional charges apply) and suite layouts are subject to availability. This triple room offers a internal view, a mini-bar, air conditioning and cable TV. Overlooking Copacabana Beach, this triple room has a cable TV, air conditioning and mini-bar. 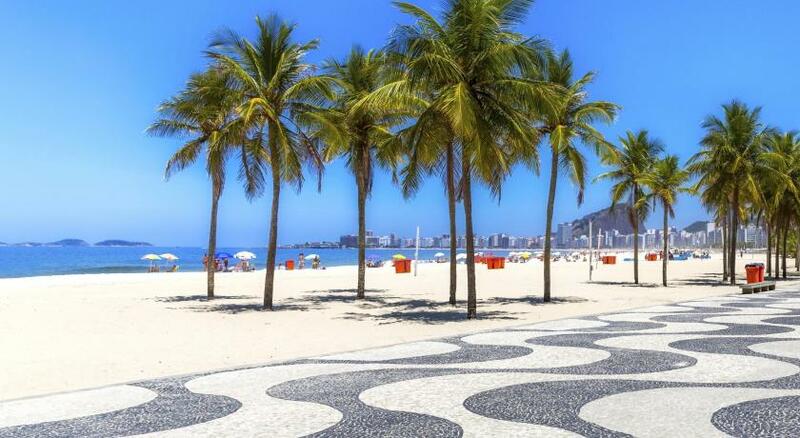 Hotel Debret: your best choice of 3 star Hotel to enjoy the waterfront and its fantastic visual.One of the unforgettable sights of the City is Copacabana Beach with the famous mosaic pavements designed in black and white. House Rules 55/RIO Copacabana takes special requests – add in the next step! 55&#47;RIO Copacabana accepts these cards and reserves the right to temporarily hold an amount prior to arrival. 55/RIO Copacabana accepts these cards and reserves the right to temporarily hold an amount prior to arrival. Please inform 55/RIO Copacabana of your expected arrival time in advance. You can use the Special Requests box when booking, or contact the property directly using the contact details in your confirmation. Poor internet connection, no towels for beach service. Hotel outdated! Needs to close down and have major revamp! Breakfast is horrible!!! Daily, almost two weeks, you get the same food. Daily to demagnetize the card by entering the room (given that not keeping it near the phone!!!!!) Standard room is extremely small, the elevators work very hard. Therefore, staff very friendly, but extremely poor services !!!!! Airconditioning was poor - we had two in our room and even with both going it was boiling. Sink facility in the room was tiny, less than approximately 20cm - only 1 small mirror over sink. Location was fantastic in Copacabana, close to walk to most things! Staff were helpful and friendly. Rio is extremely dangerous. People be weary keep your eyes opened at all times. No jewelry and as much as we need our phones mine got stolen right across the street from the hotel right on the beach. They will kill you for the shoes your wearing. Please be extremely cautious when traveling to this country. Room can’t run a/c when you’re gone. Extremely hot. The air conditioners are places behind the curtains. Even though I had to remove the curtain and leave the room lighter, the air conditioner just would not cool the room. It was horrible. The breakfast is not nice either. The fire alarm kept going on during the day and night, and the staff wouldn’t give us any explanations or directions. This hotel DEFINITELY shouldn’t be considered 4 stars. The view from the bedroom was amazing. The room was enormous, very stylish, and very clean. The location is excellent - by Copacabana beach and walking distance to Ipanema. the same breakfast was served every day and the bathroom and room was not cleaned on a daily basis , only the beds were made. The location was excellent and the staff was friendly and helpful.